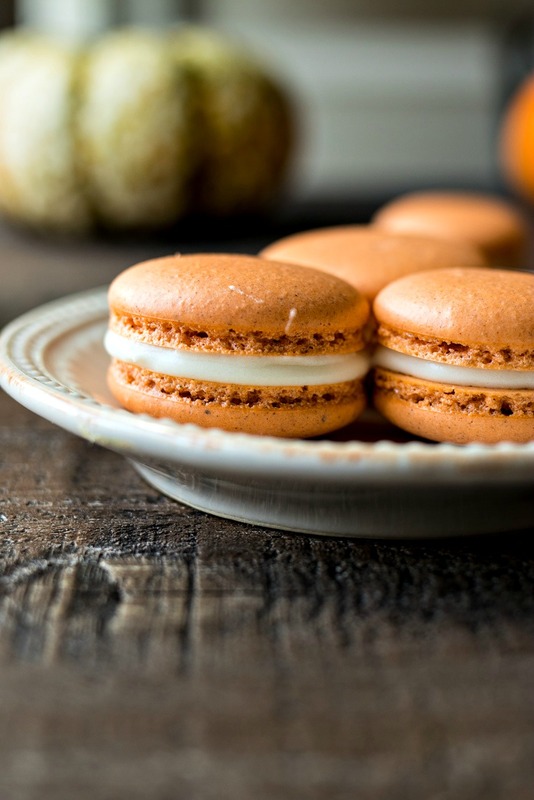 Pumpkin Cheesecake Macarons – A classic chewy french cookie is given a fall makeover with a pinch of pumpkin spice, cream cheese buttercream, and pumpkin butter. Alright guys…hold onto your hats…it’s our first pumpkin recipe of the season! And it’s also our cookie recipe for October. It’s been more than a year that I started this tradition and I have no intent on slowing down. So please send me your requests so we can keep this train going! Also around this time last year, I finally learned the proper technique for making macarons. It took lots of research and a cooking class to get there but it was all worth it. Finally, I can make these little beauties at home! Do you guys remember my post on Nutella Macarons? I talked all about the things I learned in my class (what to do, what not to do) and gave you guys every tip I knew. Make sure to go back and read this post because, though I will have a few tips at the end of this post, they will be in addition to the Nutella Macaron tips. For this recipe, I used the same macaron shell recipe as the Nutella Macarons, but I left out the cocoa powder, added a little pumpkin spice to the flour and a little color to the whipped egg whites. But the technique remains the same. For the the filling, I used the same cream cheese buttercream as the red velvet macarons I made in my first macaron attempt. But I wanted to have real pumpkin in the filling, too, in order for the pumpkin flavor to be the star of the recipe. I struggled back and forth with how to get real pumpkin in the macaron. I didn’t want to make pumpkin buttercream because it would be too much with the cream cheese buttercream in there, as well. I didn’t want to use pumpkin puree because it’s too wet and would destroy the delicate macaron shell. And then it hit me…pumpkin butter! It’s the perfect flavor and consistency for the macaron. Plus, it’s a great balance for the cream cheese buttercream. Pumpkin butter is just like apple butter – a spreadable puree of deliciousness with tons of spices – but made with pumpkin puree instead of apple (duh). I’ve seen pumpkin butter sold in stores (near the jams and jellies) but it wasn’t available at my store yet. So I just made my own using this recipe from Skinnytaste. I only made a half-batch and it was more than enough. Side note: I’ve been using the leftover pumpkin butter to flavor my coffee in the mornings. Just a teaspoon goes a long way! These macarons are so delicate, yet chewy and BEYOND flavorful. Move over, pumpkin spice latte, there’s a new favorite pumpkin treat in town! You have to use gel food coloring when coloring egg whites. Egg whites are so sensitive to moisture so, if you use liquid food coloring, you’ll ruin the consistency of the macaron. Here is a set I bought on Amazon that I love. It has every color you’ll ever need. I measure all the ingredients I use in this recipe (and all my macaron recipes) with a food scale. If you don’t have one, I highly recommend getting one. Macarons are finicky cookies so you really need to be precise here. This is similar to the one I have and I love it. There you have it – October’s cookie recipe! Where does this rank on your list of call the cookie recipes? This is definitely one of my favorites, for sure! A classic chewy french cookie is given a fall makeover with a pinch of pumpkin spice, cream cheese buttercream, and pumpkin butter. Prepare one baking sheets by placing two macaron templates on the sheet. You can print the templates above. Place parchment paper or silicone mats over the templates. Set baking sheet aside. Place oven rack in the lower half of the oven, but not all the way to the bottom. Preheat oven to 300 degrees. Add powdered sugar, pumpkin pie spice, and almond flour to the bowl of a food processor. Process the ingredients for about 30 seconds so that the mixture is super fine. Sieve the flour and sugar mixture three times. Set mixture aside. In the bowl of a stand mixer with a whisk attachment, add egg whites and cream of tartar and begin to beat on medium-high until it begins to foam. Once it starts to get foamy, begin to slowly sprinkle the granulated sugar into the egg whites until it's all been incorporated. Increase the speed to high to whip the meringue into stiff peaks. The meringue should have the consistency of shaving cream, NOT soft serve. Add food coloring and mix to combine. If you want a deeper color, add a little bit more coloring. A little goes a long way. Once the meringue is done, add one-third of the sifted flour mixture to the meringue and fold with a spatula. Do this step very carefully and slowly, cutting the mixture down the middle and swooping around. Once it's incorporated, add a second-third and gently fold in. Then, add the final third. Mix just until it's incorporated. Do not over mix. The consistency should be like slow-moving lava. To check for consistency, the batter should flow from your spatula like thick lava and hold a ribbon for a couple seconds. If it falls into clumps and doesn't fall slowly, it is not mixed enough. Keep mixing slowly so that the batter deflates a bit and the proper consistency is reached. Transfer batter to a piping bag fitted with a smooth, round 1/2 inch tip. Holding the bag in two hands directly over the parchment, pipe a small amount of batter into the first circle stencil. Stop pipping right as the batter reaches the edge of the circle. The batter will spread so don't add too much. Move on to the other circles until all the batter is gone. When you get to the end of the batter, a lot of it will stick to the bag. To push it down, use the edge of a bench scrapper. After you've pipped all the circles, smack the baking sheets on the counter a couple times to release air bubbles. Use a toothpick to pop all the air bubbles. If you don't do this step, the air bubbles will release steam while baking and crack the shells. Let them sit to dry out until the tops are smooth to the touch, about 30 minutes. They are done when you rub your finger over the top and your finger doesn't stick. Bake macarons in preheated oven for 14-16 minutes. Make sure to rotate the sheet halfway through, for even baking. Remove from oven and let them cool for 5 minutes before transferring parchment sheet to a wire rack to finish cooling. Lay half of the macarons flat side up on a baking sheet. Cut a little corner off the bag with the cream cheese butter cream and pipe a small cherry-sized amount of cream cheese buttercream in the center of one shell. Cut a very small tip of the pumpkin butter bag and pipe a small amount in the center of the cream cheese buttercream (about the size of a bean). Top with the other shell and gently press just enough to push the filling out to the edges. Do this for all the macaron shells until done. Once filled, macarons can be refrigerated in an airtight container for up to five days. Or you can freeze for up to five months. In a mixing bowl with whisk attachment, beat the cream cheese and butter until fluffy. Add powdered sugar, heavy cream, vanilla extract and salt and beat until well combined. Scrape buttercream into a plastic storage bag without a piping tip. Cut off a small corner off the bag and begin macaron assembly above. I couldn't find any pumpkin butter at the store so I made my own. I made a half-batch of this recipe from Skinnytaste. Wow, simply wow. These were amazing. I made them for Thanksgiving for my sister since she cannot eat gluten. The pumpkin butter was key and made all of the difference. It tasted like a mini pumpkin pie. I’m definitely making these again. Aw yay! I am so happy to hear this. Thanks so much for the feedback! Gorgeous macarons! I’ve been meaning to give these a go and now I think I just might. I’ll definitely make sure to check out the post you did on the nutella macarons. I made this recipe for work this week, and for the first time (my third attempt at macarons) they came out perfectly! I’ve got a few other recipes I want to try, but mainly I’d like to stick with yours. If I wanted to make lemon flavored shells for a different recipe, would I add lemon zest, or lemon extract? And when would you add them in? With the meringue? Aw love to hear that! I would tint the shells yellow and flavor the filling. Maybe use a lemon curd? But if you decide you want to also flavor the shells, I suggest using a extract so that the shell is smooth. hope that helps! I made these for our annual Pumpkin Day at work. They were fantastic! Someone else brought pumpkin macaroons as well. Everyone said (in hushed whispers) that these were way better. Thanks for the recipe! OMG pumpkin day at work?! This sounds like the best day!! I am so proud that the pumpkin cheesecake macarons were a hit. Yay! Thanks for the feedback! I love macarons! This looks delicious thanks for sharing the recipe! Oh my goodness, YUM! I cannot imagine a better fall treat! These are absolutely perfect!! I love the filling that you used, too. I need to try your recipe – I’ve never made macarons before because I’m so intimidated! Lovely! Thanks patricia! You can do this, for sure! I’ve seen the incredible recipes you share so this would not be hard for you at all! They look so beautiful and tasty, I always want to try and make macaroons but always think they will turn out wrong. I need to try and make them. You got this girl!! Let me know when you try it out! I love love love the pictures! These sound divine. I still haven’t attempted macarons yet. Aw thanks Mira!! I hope you give them a try soon! They’re much easier than you’d think! My sister would love this recipe!! Looks delicious! These are so cute and perfect! I don’t know if I’m brave enough to make macaroons on my own, but sure would gobble these up! OMG I want to try this with the kids!!!! Pinning!!! Aw what a fun idea! It looks so delicious and beautiful pics. I love making macaroons! Saving for later! Me too! Let me know how you like them!